Also, Davey D, one of my favorite people in the world, posted my Obama piece at his MySpace blog. It's sparked a lot of discussion, and I've written a follow-up to it which I'll link to here once it's published elsewhere, hopefully in the next day or so. That piece deals with the hip hop community and the 2008 Elections. 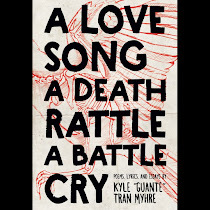 The third piece in that trilogy will be published November 5th and deals with the successes and failures of "hip hop activism." Keep checking back for those. Finally, the Culture Bully blog-a-thon was amazing. We interviewed almost a hundred artists and asked them about how arts education has impacted their lives. We got responses from Brandon Allday, Kristoff Krane, Prof Lukas, Big Zach, M.anifest, Muja Messiah, EZRA from Death Ray Scientific, Indigo, Sean from Hieruspecs, Laserbeak from Doomtree, Big Cats and more, and that's just the hip hop side-- also got stuff form Bon Iver, Lucy Michelle and many more. ALSO got a bunch of exclusive tracks from some of these artists. Check out the posts-- there are some real gems in there. Playing a show for ACORN tonight at the Bedlam Theatre in Minneapolis. 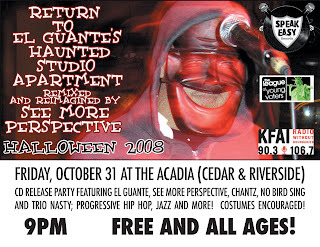 If I don't see you there, come out to Halloween at the Acadia. It's going to be great.